Liam Hendriks signed with the Twins out of Australia as an 18-year-old in 2007, but missed all of 2008 and half of 2009 following knee and back surgeries. He returned in 2010 with a fantastic season between two levels of Single-A, throwing 109 innings with a 1.74 ERA as a 21-year-old, and then thrived between Double-A and Triple-A last season while winning Twins minor league pitcher of the year honors and making his big-league debut in September. Statistically he was the best pitcher in the Twins' system in both 2010 and 2011, going from low Single-A to the majors during that time despite not turning 23 years old until last month. That includes a 3.36 ERA, 111-to-21 strikeout-to-walk ratio, and just five homers allowed in 139 innings between Double-A and Triple-A last season, but unfortunately Hendriks' strikeout rate dipped dramatically once he got to Triple-A and his raw stuff isn't quite as impressive. Hendriks is the prototypical Twins pitcher with excellent control and off-speed pitches that receive positive reviews, but his average fastball clocked in at just 89.9 miles per hour. Toss in an unspectacular, deteriorating strikeout rate with a neutral ground-ball rate and he looks like more of a strike-throwing No. 3 starter than a top-of-the-rotation guy. Kyle Gibson's injury makes Hendriks the top pitching prospect by default, but he should be MLB-ready soon. Miguel Sano was the biggest name in Elizabethton's lineup, but rookie-ball teammate and 2010 fourth-round pick Eddie Rosario actually led the Appalachian League in homers and slugging percentage while hitting .337. They each topped 20 homers in the 68-game season after a grand total of one Appalachian League hitter had 20 homers in the past 20 years. Rosario can't compete with Sano's raw power, but should have far more defensive value. At which position is unclear, because after playing Rosario in center field last season the Twins have moved him to second base in the hopes that he can fix their longstanding inability to develop middle infielders. Rod Carew and Chuck Knoblauch are the only second basemen in Twins history with an OPS above .750 in multiple seasons, which along with the organization's strong outfield depth certainly makes Rosario in the infield a worthwhile experiment. Last year's record-setting slugging probably overstates Rosario's long-term power potential, but the 20-year-old left-handed hitter clearly has plenty of pop and moving up to full-season competition at low Single-A should provide a clearer picture of his all-around upside. So far he's hit .319 with 26 homers and 39 steals in 118 games after Baseball America's pre-draft report called him "the best pure hitter" in Puerto Rico and compared him to Bobby Abreu. Aaron Hicks' stock has gradually slipped since the Twins drafted him out of high school in 2008 and the expectations of a No. 14 pick shape how he's perceived. On one hand Hicks is a speedy 22-year-old center fielder with good range and a strong arm, led the system with 78 walks last year at high Single-A, and has a .377 career on-base percentage. On the other hand he's a .266 hitter, hasn't developed power, and struggles from the left side of the plate. His upside certainly looks lower now than two years ago, but it's too early to write Hicks off as a bust. His defense, speed, and patience are all impressive, although it's possible he's actually too passive at the plate. And while the lack of pop is disappointing he's hardly in Ben Revere territory. Hicks had a .126 Isolated Power and 41 extra-base hits in 443 at-bats for Fort Myers. Revere had a .058 Isolated Power and 19 extra-base hits in 466 at-bats there in 2009. Compared to Revere at the same age and level Hicks hits for twice as much power and draws twice as many walks. Revere is faster and has more range, but Hicks is also considered a strong defensive center fielder and has a vastly superior arm. Revere's flaws were just more easily hidden by lofty batting averages and even now Hicks has more all-around upside, but he absolutely needs more pop or consistency switch-hitting to look like a potential star again. Joe Benson was pressed into major-league duty by the Twins' many injuries and predictably struggled while making the leap from Double-A to the majors at age 23, but prior to an ugly September he was very impressive in New Britain. Whether he should have been essentially repeating Double-A after spending most of 2010 there is a legitimate question, but he showed improvement while hitting .285 with good power, better patience, and fewer strikeouts. Benson's inability make consistent contact is the biggest red flag in an otherwise well-rounded game, but while he whiffed 21 times in 74 plate appearances for the Twins his Double-A strikeout rate improved from 27 percent in 2010 to 23 percent in 2011. Overall in 213 games at Double-A he's smacked 39 homers and 98 total extra-base hits for a .241 Isolated Power. By comparison, Harmon Killebrew has the top Isolated Power in Twins history at .258. Benson isn't the second coming of Killebrew, but should have 25-homer pop with plus speed and center field range with a right field arm. 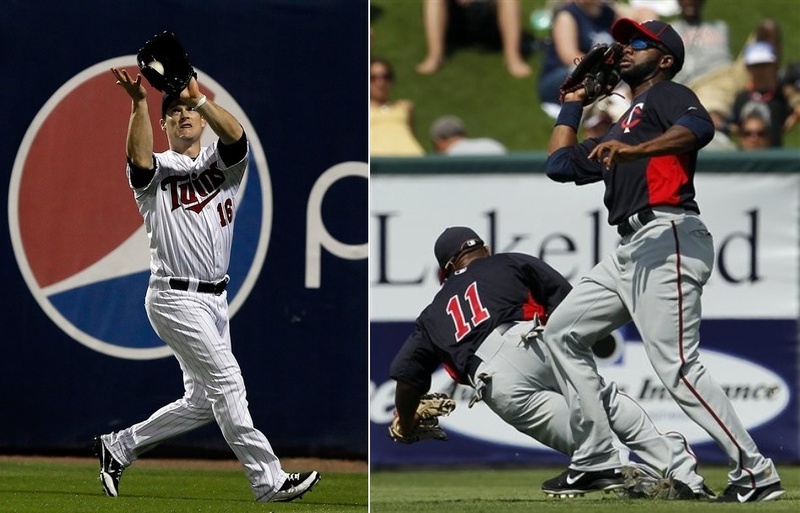 His all-around upside isn't far off from Michael Cuddyer, who manned right field for the Twins from 2006-2011. Cuddyer hit .282/.373/.478 in 279 games at Double-A, compared to .269/.363/.510 for Benson. Cuddyer also crushed Triple-A pitching after that, which Benson will finally get a chance to do this season. Miguel Sano has lived up to the hype and then some so far, emerging as one of baseball's elite prospects three years after the Twins signed him out of the Dominican Republic as a 16-year-old for a record $3.15 million bonus. As a soon-to-be 19-year-old who's yet to advance past rookie-ball Sano's odds of going bust are considerably higher than most top prospects, but his upside is incredible and his early production has been jaw-dropping. Sano was 6-foot-3 and 200 pounds when the Twins signed him and is now at least 240, which is why his remaining at shortstop was a pipe dream and even sticking at third base may be a stretch. It would be nice to have a slugging third baseman instead of a slugging right fielder or first baseman, but if Sano's bat develops as hoped he'll be MVP-caliber anywhere on the diamond and join Justin Morneau as the only Twins with multiple 30-homer years since 1987. He's struck out 137 times in 127 games and hasn't walked much, but that's expected from a raw teenager and Sano has hit .300/.364/.572 in pitcher-friendly environments. Last year he blasted 20 homers and 45 total extra-base hits in 66 games, slugging .637 in a league that slugged .404. Anyone who sees Sano inevitably comes away saying the same two things: He's massive and the ball explodes off his bat. And he's the best Twins prospect since Joe Mauer. This week's episode of "Gleeman and The Geek" was recorded at Bunny's in St. Louis Park and we had multiple beers of choice. Topics included the outfield realignment and Ben Revere's role, what Chris Parmelee means for Justin Morneau, returning Rule 5 pick Terry Doyle to the White Sox, why grandparents hate Drew Butera, schmoes vs. schlubs vs. schmucks, drugs of abuse, Delmon Young's claims, The Hunger Games, and the folly of spring training numbers. Brian Dozier was the Twins' eighth-round pick out of Southern Mississippi in 2009 and had an underwhelming first full season in 2010, hitting .275/.350/.349 in 132 games between two levels of Single-A as a 23-year-old. He entered last year as a marginal prospect, as evidenced by the Twins having him repeat high Single-A at 24, but Dozier hit .322/.423/.472 in 49 games to force a midseason promotion and then batted .318/.384/.502 in 78 games at Double-A. Overall he batted .320/.399/.491 with nine homers, 54 total extra-base hits, 24 steals, and nearly as many walks (55) as strikeouts (66) in 127 games, which put Dozier squarely on the prospect map and got him named Twins minor league player of the year. That likely overstates Dozier's upside, as he had a very good but not spectacular season as a 24-year-old between Single-A and Double-A, but there's no doubt that he's now in the Twins' plans. Dozier has shown good on-base skills at every stop with a .307 average, few strikeouts, and a fair number of walks, but his power potential is iffy and his ability to play shortstop in the majors is often questioned. Even as a singles-hitting second baseman Dozier would be plenty useful because of the Twins' longstanding inability to develop middle infielders, but handling shortstop and smacking double-digit homers would make him a long-term building block. Alex Wimmers won back-to-back Big Ten pitcher of the year awards at Ohio State and was touted as one of the 2010 draft's most advanced pitchers when the Twins selected him 21st overall, but his first full pro season was derailed by extreme control problems. He walked the first six hitters he faced, was immediately removed from the high Single-A rotation, and spent three months trying to avoid going further down the scary Steve Blass/Rick Ankiel path. He rejoined Fort Myers as a reliever and later moved back into the rotation, pitching well while avoiding any serious control issues. And then in his final start of the season Wimmers threw a seven-inning no-hitter, issuing just two walks while facing the minimum 21 hitters in a 1-0 win. After his disastrous season debut and lengthy stay in extended spring training Wimmers threw 41 innings with a 3.32 ERA, 39-to-16 strikeout-to-walk ratio, and .189 opponents' average. He's certainly not out of the woods yet, but Wimmers is back on track and should move quickly through the system if he can throw strikes. He lacks top-notch raw stuff, but the 6-foot-2 right-hander combines a low-90s fastball with an oft-praised changeup and has 62 strikeouts in 56 pro innings. And prior to the extreme wildness Wimmers' control was actually a major strength, so he fits the Twins' preferred pitching mold and projects as a potential mid-rotation starter. Not only is Levi Michael the first college middle infielder picked by the Twins in the first round or supplemental first round since LSU second baseman Todd Walker in 1994, they last used a first rounder on a college hitter of any position for Clemson catcher Matthew LeCroy in 1997. As a three-year college starter who figures to move through the system quickly Michael fills an obvious need in an organization that has long struggled to develop middle infielders. Michael had a disappointing junior year after a monster sophomore campaign, hitting just .289 with five homers in 65 games, but that was partly due to injuries and the switch-hitter still got on base at a .434 clip with more walks (49) than strikeouts (47) and 15 steals in 16 tries. Despite the down year ESPN pegged him as "the top college shortstop in the class" and Baseball America ranked Michael as the draft's 22nd-best prospect. Defensively there are some questions about Michael's ability to stick at shortstop, but prior to the draft Baseball America noted that "scouts are warming up to the idea" and publicly at least the Twins are optimistic. He signed too late to debut last season, agreeing to a $1.175 million bonus just hours before the August 15 deadline, so Michael will likely spend most of this year in the low minors and hopefully force his way into the Twins' plans by late 2013. By going well beyond the MLB-recommended slot bonus and taking a chance that the stress fracture in Kyle Gibson's forearm would heal the Twins were able to snag a top-10 talent with the 22nd pick in the 2009 draft. He debuted in 2010 by cruising through three levels of the minors with a 3.04 ERA and 118-to-36 strikeout-to-walk ratio in 142 innings and got off to a strong start at Triple-A last season, posting a 3.60 ERA and 59 strikeouts through 55 innings. Gibson began to struggle in June, going 0-5 with a 6.47 ERA over an eight-start stretch, and was eventually diagnosed with a torn elbow ligament elbow. He underwent Tommy John surgery in September, which means Gibson is no sure thing to pitch at all this year and is unlikely to reach the majors before mid-2013. It's a shame, because he was looking MLB-ready as a potential No. 2 starter with good control, above-average stuff, and lots of ground balls. Making a full recovery from Tommy John surgery is a much better bet now than it was even five years ago, but in recent Twins history Francisco Liriano and Pat Neshek have shown that it's still not guaranteed. Gibson's best-case scenario is making a few late-season appearances in the minors and beginning 2013 as a full-time member of the Triple-A rotation at age 25, setting up a possible midseason call-up to Minnesota. Lots of hurdles to clear before then, though. Oswaldo Arcia signed with the Twins out of Venezuela as a 16-year-old in 2007, fared well at low rookie-ball in 2009, and then burst onto the prospect scene by hitting .375 with 14 homers and a .672 slugging percentage in 64 games for rookie-level Elizabethton in 2010. That earned Arcia a promotion to low Single-A last season and he hit .352 with five homers and a .704 slugging percentage in 20 games before being shut down with an elbow injury. Minor surgery and a stint on the disabled list followed, but instead of Arcia simply rejoining the low Single-A lineup once he got healthy the Twins immediately promoted him to high Single-A. He held his own in Fort Myers, hitting .263 with a .460 slugging percentage, but as you'd expect from a 20-year-old facing much older, more experienced competition Arcia posted a hideous 53-to-9 strikeout-to-walk ratio and ugly .300 on-base percentage in 59 games. Promoting him so aggressively was very out of character for the Twins, especially considering Arcia was coming back from elbow surgery, but regardless of the wisdom behind the move it certainly shows how highly they think of him. Aside from Miguel Sano he might have the highest-upside bat in the Twins' system, but a 137-to-37 strikeout-to-walk ratio in the low minors during the past two seasons should keep expectations somewhat in check for now.